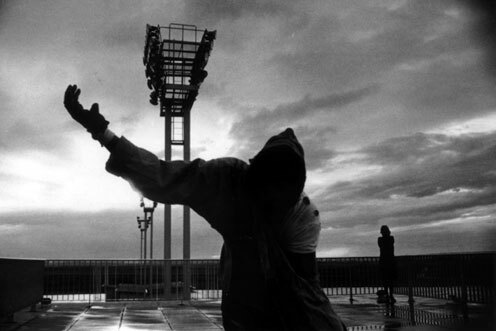 Chris Marker describes his work La jetée (1962) as a photo-roman in the opening titles. This apt form is used to tell a fragmented story of love, memory and abstracted time travel. Marker optically printed black and white photographs onto cine-film and added a narrator and sound effects for this 28-minute piece. Often mentioned, there is one fleeting moment of moving image in the film, which originated on 35mm and acts as a punctum to the still images. It is difficult to say what Marker’s film is and what it isn’t, as it is so open, but the photo-roman form allows for a very particular and illuminating relationship with the content. The photo-roman, the photo-story, the comic strip and even the current trend for PowerPoint slide presentation uploaded to YouTube are all a way of bypassing the labour of filmmaking. All, I would say, are a convincing way to communicate a visual story. A scene can be summed up with a part of the whole and the viewer’s mind is activated and invited to form their own conclusions in the spaces between the stills. The tradition of the photo-roman dates back to the medieval period where scrolls of text or phylacteries were incorporated into religious painting. These phylacteries originate as the small rolls of Torah carried by observant Jews as aides-mémoires. The term phylactery went on to be used to indicate the speech used in graphic novels or any kind of protective amulet. In La jetée, the narrator, in the place of a phylactery, takes part in our piecing together of the stills, guiding us in their interpretation. As we engage in this film our own memory may be stirred: of war crimes; a romance; a non-linear relationship with time; the way a film image becomes entwined with our own personal traces and fundamentally our freedom to think. ‘The man’ in La jetée is a prisoner some time after the Third World War in Paris. The victors have colonised underground galleries to escape the upper world riddled with radioactivity. A group of military scientists are running experiments in their search for an emissary into the future who can return with resources to ensure the well-being of the human race. The man is haunted by a childhood memory of a woman at the end of the main jetty at Paris-Orly airport and of a man being shot as he walks to meet the woman. The scientists, judging he is of robust enough mind to visualise the past in this way believe he can endure the trauma of visualising the future. Photographs of scientists are layered with the sound of whispering in German, sometimes there is the sound of a heartbeat that is indiscernible from the sound of military marching. During the trial, the man ‘travels’ back in time to a pre-war period where he enjoys an idyllic romance with a woman he recognises as being the woman from the jetty. Their world is described as ‘dateless’ and a time of affluence. This part of the test accomplished, the scientists think he is ready to go forward in time. He does so and meets the survivors of the human race in the future, who have thrived as a result of his own mission. He returns with a source of energy for Earth and as his reward, these future citizens give him a choice of what period to live in. He chooses to return to the moment on the jetty that has haunted him. On returning, he sees the woman, but as he approaches her, it is him who is shot by one of the victorious assailants who has followed him through time. Within the story, the man doubts whether the pictures in his mind are dreams, memories or visual derivations of stories he knows. The narrator tells us: ‘Nothing sorts out memories from ordinary moments.’ The narrator directs us through this photo-montage and suggestions are made as to what we are looking at, but what the viewer understands to be a memory could be a real-time event, real time could be an implant, memory could be a dream. The man is also disorientated and a strong theme of doubt emerges. Part of the man’s mental experience is a sequence of close-up images of the woman lying in bed. Stills of her face dissolve into one another and surreal, ambiguous shapes are created on the transition: an eye slips down the side of the cheek, mouths are doubled, the body is dislocated. When I look at the film on YouTube there is even more motion created from the artefacts from low-quality compression. This strange animation of the stills shifts again when the only moving shot plays out: an uncanny moment when the woman blinks. Marker sets up a conflict between the animation of the stills and the moving clip of the woman. She seems re-animated as she is released from her own stasis as a still image, but arguably she was already ‘moving’. With this interplay of still and moving image Marker throws into question the nature of the scene placed before us. The narrative vehicle for our experience of this disorientation is also a type of stasis that the man believes himself to experience during the experiments. Marker uses the science fiction concept of stasis to both suggest that the man might be transcending his physical bounds but that he might also be simply having a range of disordered thoughts and memories. Either way, Marker refers to the motif of ‘cheating death’ that stasis invokes. Stasis allows the body to be shut down to a semi-human state where individuals can travel for long distances or durations. Often cryogenics is employed, where the body is frozen and then resuscitated unharmed. This concept can be traced back to the wild imaginings of Edgar Allan Poe. I think particularly of ‘The Facts in the Case of M. Valdemar’ (American Whig Review, 1845) where a man at the point of death from tuberculosis is placed in a hypnotic trance by a mesmerist, who is the unnamed narrator of the ‘case’. Poe presented the story as a factual scientific experiment where Valdemar defies death and remains in this unearthly state between life and death for seven months. When released from the trance he immediately decays into a ‘liquid mass of loathsome – of detestable putrescence’. Links can be made between Poe’s text and the photo-roman as both Marker and Poe reflect with some resolve that death cannot be outdone. In Marker’s piece, death is also linked with the authority of the scientists. Both impose metaphysical and political limits, the epitome of this in La jetée being the restrictions on the man’s romance with the woman. He can visit her, he is ‘her ghost’, but he is always pulled back. Marker suggests there is always a greater power watching over our being; within the narrative of the film this is the apocalyptic victors. Indeed, the film reflects on the subjugation of the individual to superstructures, I don’t think it is a coincidence that the film was made in the same year as the Cuban Missile Crisis, arguably the height of the Cold War. When the man is killed off by one of the underground servicemen, the grandiose testing of his mortality comes to an abrupt halt. The cyclic scene of the man’s death, that always followed him, suggests that his life was always at risk. In many ways stasis, a concept that allows for such ideal concepts of mental wanderings through time, is revealed in science fiction film to be colonised and controlled by bureaucracy. The dilemma, typical to the genre, of freedom of the imagination versus the institutions and structures that aim to limit our minds is taken on by Marker in La jetée. This dynamic resonates in both the content of the film and in its form. The photo-roman form, however, breathes air into these themes of restriction. Marker trusts in the viewer’s capacity to fill in the gaps between the still images, and to me this is the work’s overarching power. While commenting on the possibility for mind control, ultimately, La jetée offers an alternative.